Tanishq Abraham, an 11-year-old Sacramento boy, graduated from American River College (ARC), California, alongside 1,800 students on May 20. Tanishq Abraham, who has an abnormally high IQ, said regular school “bored” him. He told KXTV that it “feels good to graduate with three Associate’s degrees,” which he earned in math and physical science, general science and foreign language studies. The boy graduated from high school at the age of 10 and has been taking classes at ARC since he was 7 years old, NBC reported. Tanishq Abraham first began taking a class in astronomy at River College, his local community college, at age of 7, while he was still being homeschooled in high school-level subjects by his parents. 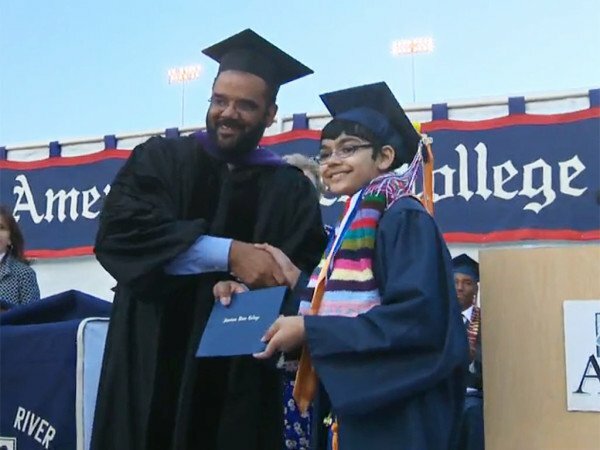 Last year he reportedly passed California’s early-exit high school exam, officially graduating high school, and enrolled in college full time. Home-schooled by his mother, Tanishq Abraham earned a 4.0 GPA in high school. Tanishq Abraham has been a member of Mensa International, an academic and social organization for people whose IQs fall in the top 2% of the population, since he was 4 years old. “The assumption is that he’s the all-time youngest,” a spokesman from American River College told KCRA. This summer Tanishq Abraham plans to take a Calculus II course. Tanishq Abraham lives in Sacremento with his parents and his 6-year-old sister, Tiara. Both of the siblings reportedly joined Mensa when they turned four years old. They spend their free time singing, painting, and playing computer and video games. But Tanishq Abraham says his favorite past-time is writing articles for NASA.